All the coins showing relative size. For more information on a coin, either scroll down or click on a coin. After the death of King George V his son, who would have been King Edward VIII, abdicated before the coronation. No coins were minted using his portrait. 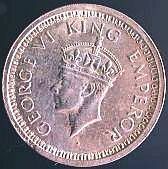 His brother the Duke of York was crowned King George VI in May 1937 and the first coin of India with his effigy was minted in 1938. After the price of silver started going up after the outbreak of World War II in 1939, the practice of hoarding silver coins became common. This led to reducing the use of silver in coins. 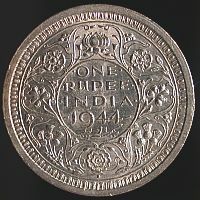 The 1940 1/4-Rupee, 1/2-Rupee and One Rupee coins were reduced from 0.917 silver to 0.500 silver (there were a limited number of 1939 Rupees minted in 0.500 silver). Though not listed by Krause, D. Chakravarty reports 1940 1/4 Rupees exist in the earlier 0.917 silver version. There are many interesting varieties in the King George VI series, which I'll try to sort out below. It will take some time to document all the varieties since my reference collection is missing many of them. The Rupee was minted in Calcutta, Bombay and Lahore in 0.917 silver, 0.500 silver and Nickel with a reeded edge and later a security edge. There is no mint mark for Calcutta. The Bombay issues have a small dot or diamond on the reverse under the ornate (the lotus flower) near the bottom of the coin (see illustration). The Lahore mint used a small "L" in the same position. When the composition switched to Nickel in 1947 a completely different reverse (an Indian tiger) was introduced. The 1/2 Rupee was minted in Calcutta, Bombay and Lahore in 0.917 silver, 0.500 silver and Nickel with a reeded edge and later a security edge. There is no mint mark for Calcutta. The Bombay issues have a small dot or diamond on the reverse under the ornate (the lotus flower) near the bottom of the coin (see illustration). The Lahore mint used a small "L" in the same position. When the composition switched to Nickel in 1946 a completely different reverse (an Indian tiger) was introduced. The 1/4 Rupee was minted in Calcutta, Bombay and Lahore in 0.917 silver, 0.500 silver and Nickel with a reeded edge and later a security edge. There is no mint mark for Calcutta. The Bombay issues have a small dot or diamond on the reverse under the ornate (the lotus flower) near the bottom of the coin (see illustration). The Lahore mint used a small "L" in the same position. When the composition switched to Nickel in 1946 a completely different reverse (an Indian tiger) was introduced. There are several varieties in the obverse and two major varieties of the ornate (lotus flower) on the reverse. The 1 Pice coin was only minted for five years, but it has three crown different varieties and was made at four different mints. It's shape is also unique, with the hole in the center (sometimes referred to as a "washer" shape). The obverse varieties are recognized by the crown design on the obverse designated Round Crown (RC), High Crown (HC) and Flat Crown (FC). A second difference is the size of the lettering and date numerals, small (Y-51, KM-532) and large (Y-51a, KM-533). The mint is designated by a mint mark just under the date on the obverse: Calcutta (no mint mark), Bombay (large dot), Pretoria, South Africa (small dot) and Lahore (raised "L"). Krause indicates in 1944 the Bombay mm appears to be a large dot over a diamond. My 1943 Bombay appears to have a double dot. 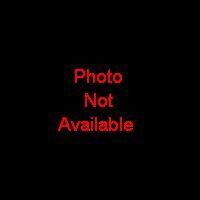 The Second Head variety was only struck as proof or restrikes, so only the First Head is shown here. It was only struck for circulation 1939-1940. It is reported by Krause that it was also struck in 1938 but none have been found in circulation. The 1/2 pice was struck in Calcutta (no mint mark) and Bombay (dot below date on reverse). The 1/12-anna comes in two obverse varieties, First Head and Second Head. It is interesting that both varieties were used in 1938 and 1939. For both varieties, the 1938 strikes were proofs or restrikes, not circulation coins. The 1/12-anna was only minted through 1942 and was then discontinued.